We’ve all participated in the annual tradition of setting resolutions that challenge ourselves personally – to become more physically fit, save money or take up a hobby. Most successful entrepreneurs also agree that it’s good business to develop resolutions for your company as these goals are the foundation to clearing a path for the year ahead. Berwyn Tech Entrepreneurship Center (BTEC; berwyntech.com), 2137 Oak Park Ave, has launched their “gym for business growth” that aims to be a hub for providing support services from technical assistance to mentorship at any phase of a business’s life cycle including pre-start, start-up, growth or transition. 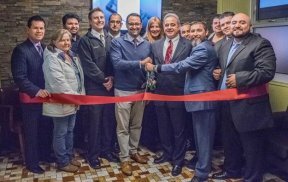 BTEC held a ribbon cutting in partnership with the City of Berwyn and the Berwyn Development Corporation (BDC) on February 2, 2017. At its core, BTEC aims to be a diverse community center founded on connecting entrepreneurs to formal educational resources and experienced advisors as well as to tapping into peer networks for both learning and camaraderie. In a phrase, they “expose, educate, employ and empower” their clients to develop an entrepreneurial mindset and to innovate together. Expect to see the team working with students who want to learn more about business, with newcomers looking to test their ideas and with companies looking for reinvention. This all happens in a 6,000 square foot building that offers 10 offices along with meditation and media rooms. Future plans include rooftop and first floor patios for meetings and al fresco workspace. The Center was founded by Diocelino “Chico” Rangel. Rangel is a serial entrepreneur with over 20 years of experience solving workforce challenges for companies and communities.